With UP and DOWN buttons and MORE !!! 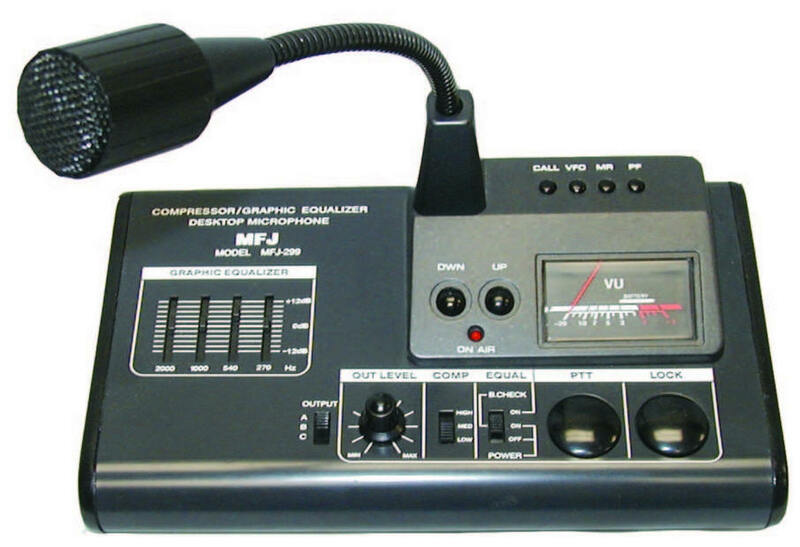 "This is the most complete ham station desktop microphone console you'll ever own! MFJ-299 has a high quality compressor amplifier with high, medium, and low selection switches. It always sends out a constant and optimum level w without distortion, regardless of audio input level. The high switch (45dB) is selected when you speak in a low voice or away from the microphone in a quiet place. MFJ-299 has a built-in battery check circuit. It lets you press the power switch and the level meter will indicate the battery condition with power voltage for a few seconds." Thanks so much for the MFJ 299 Mic. And it was so well packed. I was not certain I was making the best choice in mics, as we have no shops in my area to physically get your hands on something first to see if it is what you really need. So for having never even touched an MFJ299 before, I was very impressed. Not only is it a very solid (all metal) microphone, but it sits well on the desk and is easy to get used to operating. After hooking it up, it does take a little time to dial it in. Sure helps to have talkback with a set of good headphones on. I had read it was a little touchy, but I have not noticed that, once I got it dialed in. Great reports back on the sound. And the Modulation easy easy to adjust, even on the RCI. It allows easier control by pulling my RCI's mic gain down some and using the gain on the Microphone for slight changes as necessary. The EQ is a little tricky, it has some very large adjustment capabilities at 12 db. either way. But once mastered really does make the voice sound better. The 3 position Compression selection is absolutely great. Overall, I am really enjoying it. Really helps when sitting away from the Mic a bit. I've picked out a couple of comfortable positions, while at my desk, and I can switch between settings to properly adjust for either. I had always been a D104 guy in the past, but this MFJ299 is a cut above in sound control and sound quality. And I am so glad I didn't give up my channel switching functions of my RCI 2970n2 with a new mic. Now if I could get some slight Echo on it. Maybe that's the next project. This is reprinted with Ed's permission. This microphone has NO Receive switching and cannot be used with any radios that require the microphone to be plugged in to hear the receive. Simply put, Regular CB Radios like Cobra 29LTD, Cobra 2000, Washington base station etc....Will NOT work with this microphone. 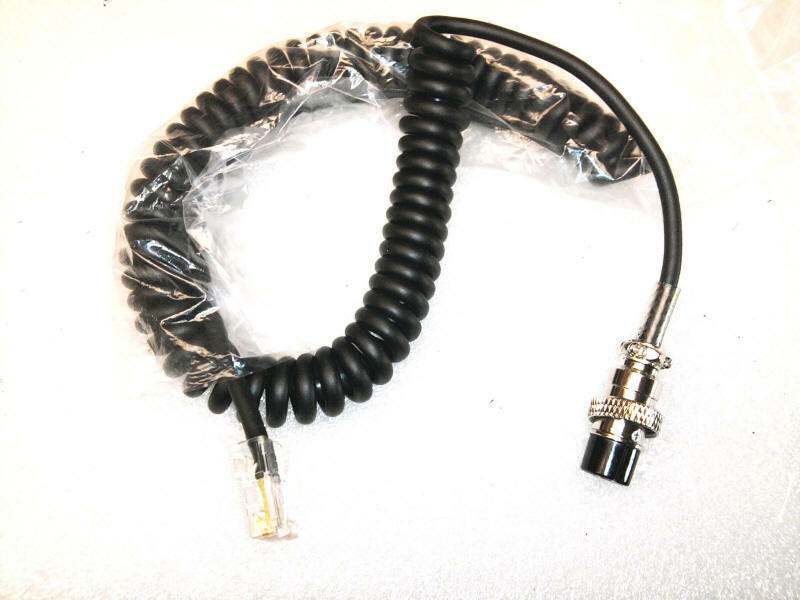 Wired with high quality coiled full length microphone cable, an RJ45 type plug on one end and a plug of your choice on the other end. 4 pin Plug for Ranger, General, Galaxy, Connex and more.